How do you navigate inside TurboCoder? How do you search inside TurboCoder? How do I get rid of the search panel? Put your finger at the bottom of the search panel and swipe upward quickly. Tap the magnifying glass to bring the search panel back. How do I resize the Navigation and Viewing panels? Use a pinching movement with thumb and finger to make the viewed panel smaller or streching to make bigger. Alternatively use the buttons on the toolbar to resize text. 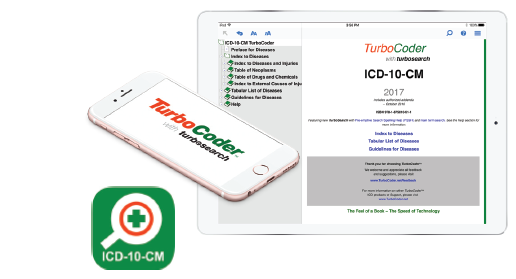 Why is ICD-10-CM App slow on my iPad? Many apps run in the background using your devices resources. Check to see how many apps are running by double clicking the home button. When you press it twice in quick succession it shows all currently open apps in the task screen. To close an app, hold your finger down on the window, and without lifting your finger from the screen, swipe toward the top of the display. The TurboCoder App has an in-built Help section that lists and explains all the features available without leaving the App. Please email us if you would like further advice on how to get the most from your new TurboCoder App. It takes up little space. The file always stays compressed with eComPress technology that allows for fast downloads for new installations and future updates.